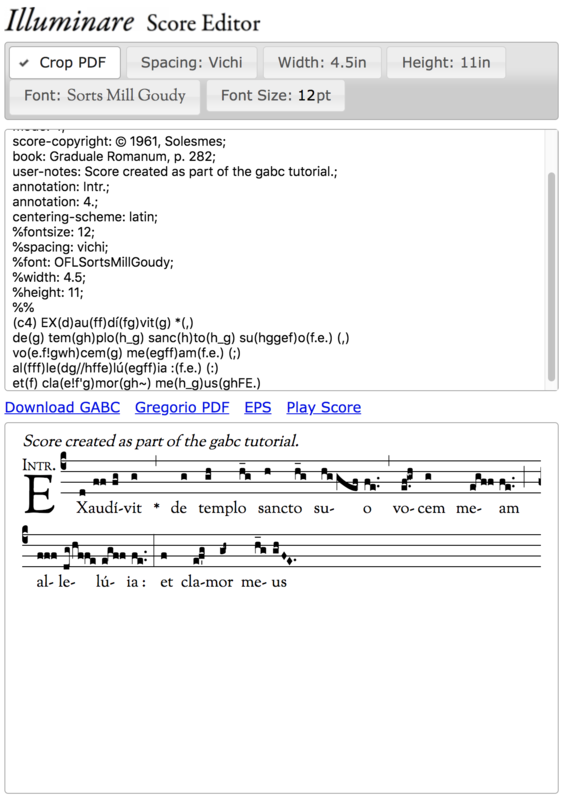 The purpose of this tutorial is to demonstrate how to represent a Gregorian chant score in gabc. 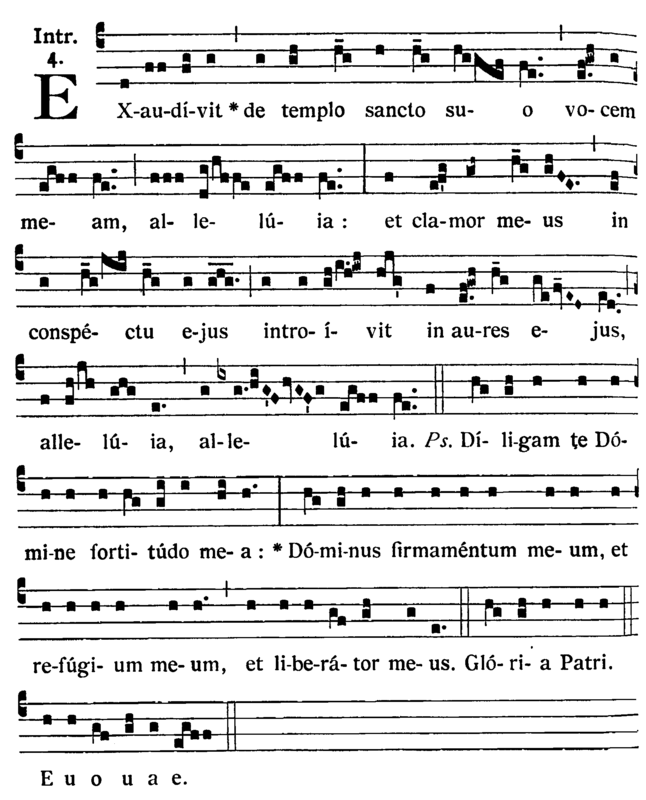 However, we are not going to assume a familiarity with the terminology used to describe such a score in order to make this introduction easier to follow for those who are relatively new to chant more generally (and not just typesetting it). Documentation for the gabc notation which we use in this tutorial can be found here. We will also link to the various parts of the documentation as it becomes relavent. A one-page summary is also on-line (PDF). In this tutorial we’ll be using the Illuminare Score Editor and all the images will be derived from that tool because it has a built-in preview window that gives us nearly instantaneous feedback about what we’re doing. 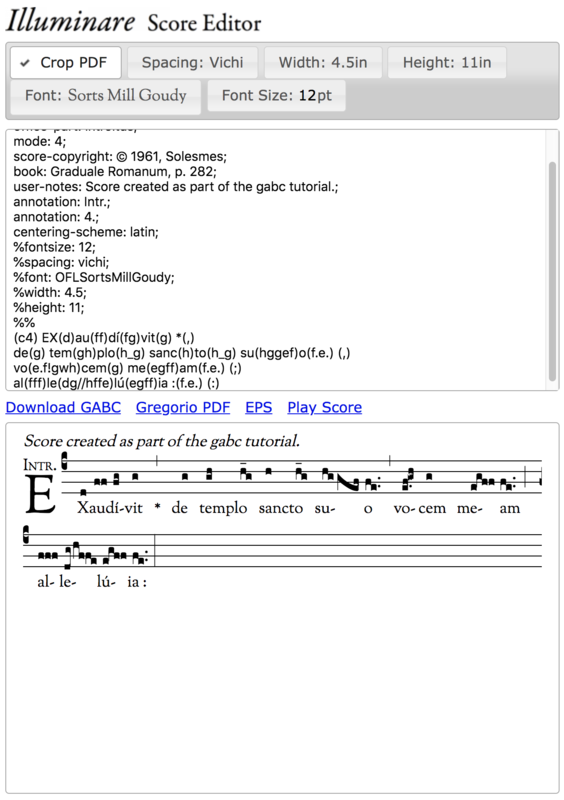 However, you could also use the Gregorio Chant Engraver if you prefer that. 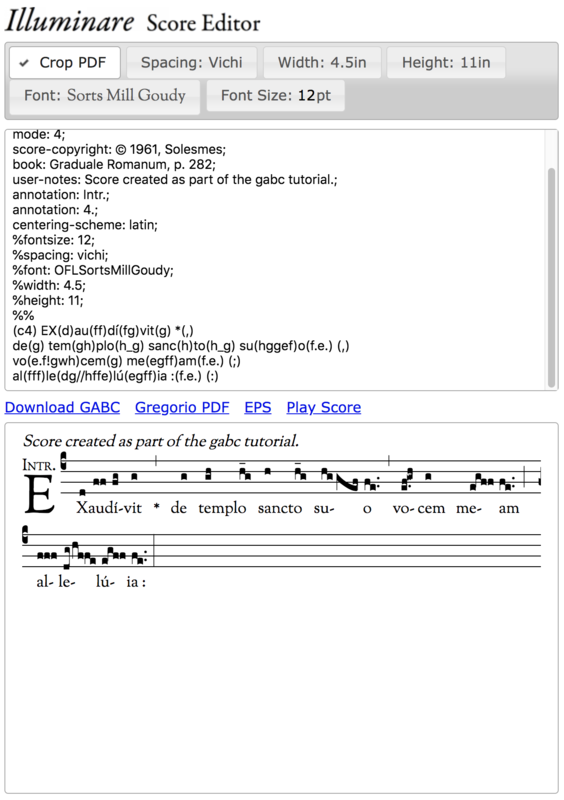 Obviously the images won’t match and some of the specific interface issues are different (including the lack of an instant preview), but the gabc itself is identical and we are specifically going to focus on that gabc notation. This makes for a much easier introduction for those not familiar with TeX. Once you’re comfortable with gabc notation, then you’ll find learning how to integrate it into larger projects using TeX much easier (as is done in our other tutorials). 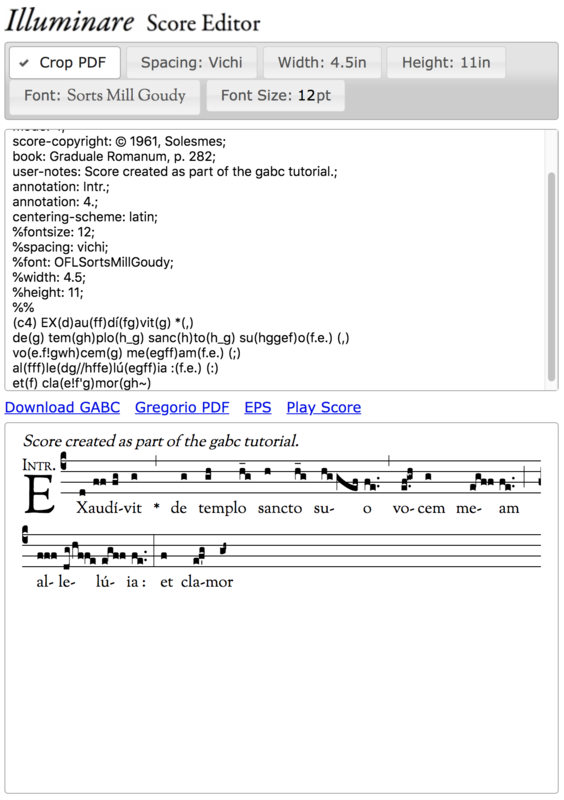 It’s not the simplest score in the world, but it is not overly complicated either and it illustrates several of the most common features of Gregorian chant allowing us to call out how to represent these using gabc as we go. The top most pane allows us to control certain elements of how the score appears. We won’t be dealing with these in this tutorial. The bottom most pane shows us a preview of our score. 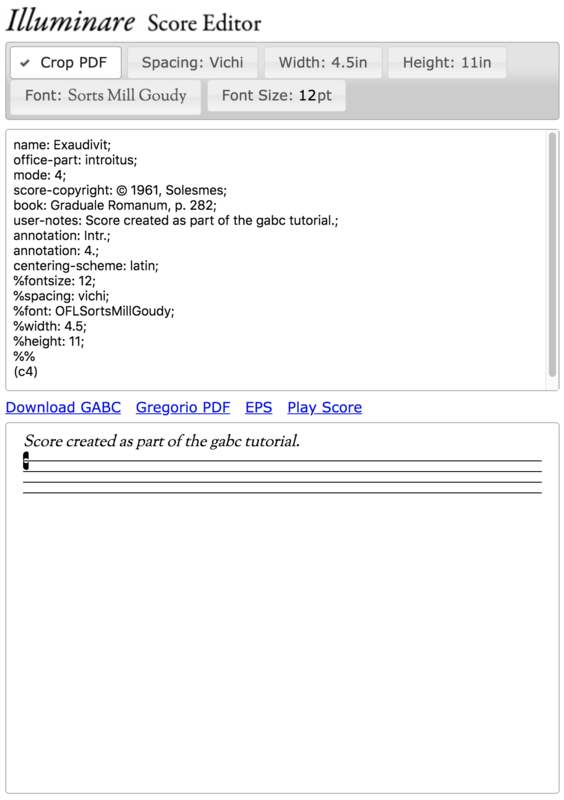 Illuminare will update this in real time as we work so you’ll be able to see exactly how the gabc you’re entering translates into a score. This line is an empty header field. Headers are for describing you score so that when you come back to the file later you can figure out what it is, where it came from, and other things like that. This particular field is there for you to record any information that you want about the score. In this case I’m going to make a note that this is part of this tutorial. That note goes between the colon (:) and the semi-colon (;). This line is also an empty header field, but it’s for specific information about the score. In gabc parlance the commentary is the text that appears just above the top line of the staff and is flushed right. This is usually a scripture citation. Our piece, however, doesn’t have this line so we’re going to delete this line. Like commentary, annotations refer to a very specific part of the score in gabc parlance. In this case it’s the text which goes above the initial. Our score has two lines there, and fortunately gabc supports up to two annotation headers. This header is actually a legacy header which is no longer supported in Gregorio. It formerly controlled how the text of the lyrics aligned with the notes above. This is now controlled in the TeX of a document, but because Illuminare doesn’t give you access to that, it's continued use of an older version of Gregorio means that you still have access to it. In this case our text is in Latin and thus follows the Latin alignment conventions. In more recent versions of Gregorio we refer to this as vowel centering in order to be more descriptive. These headers are not official headers, but rather ones which is specific to Illuminare. You’ll notice that the correspond to the features in the topmost panel and serve to record those settings so that you can duplicate them later should you need to (say for another score which will be part of the same document and thus should look similar to the first score). The % at the beginning of each line indicates that the line is to be treated as a comment. That is, Gregorio is to ignore it when parsing the gabc. Unlike the single % on the previous lines, this double %% does not instruct Gregorio to ignore this line. 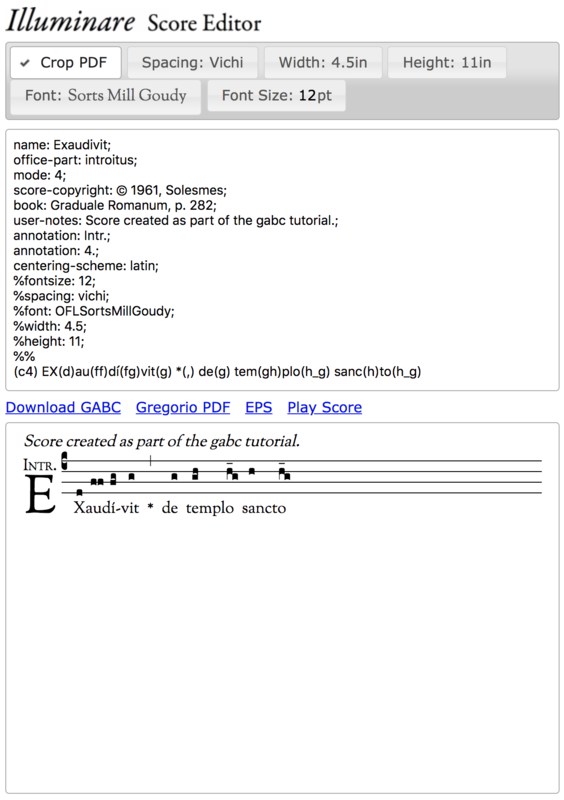 Instead it indicates that we’re done with the headers and ready to begin the score itself. This is the first part of the score and indicates the starting clef. There are two clefs in gabc: do (c) and fa (f) and each can be on any of the 4 lines (1 on the bottom, 4 on the top). This here is a do clef on the 4th line, which is actually what we have in our score, so we’ll leave it alone. 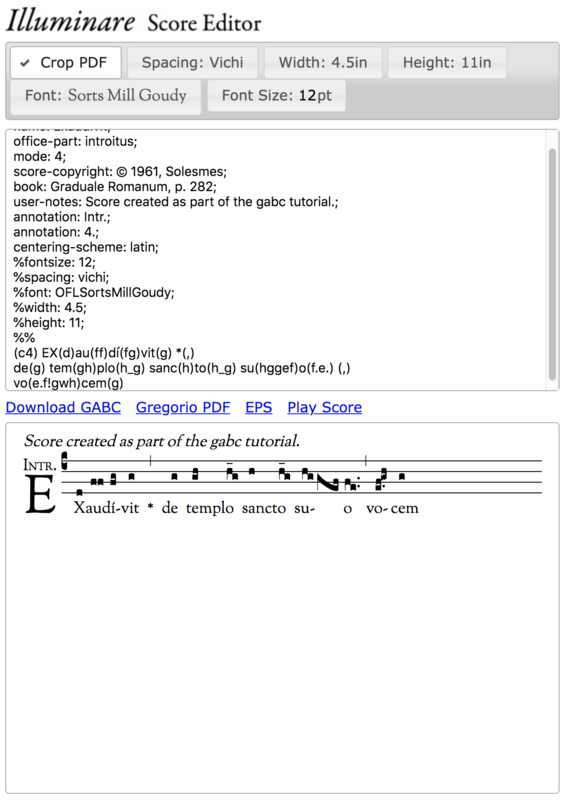 As you can see, the user notes have been placed as text above the score. 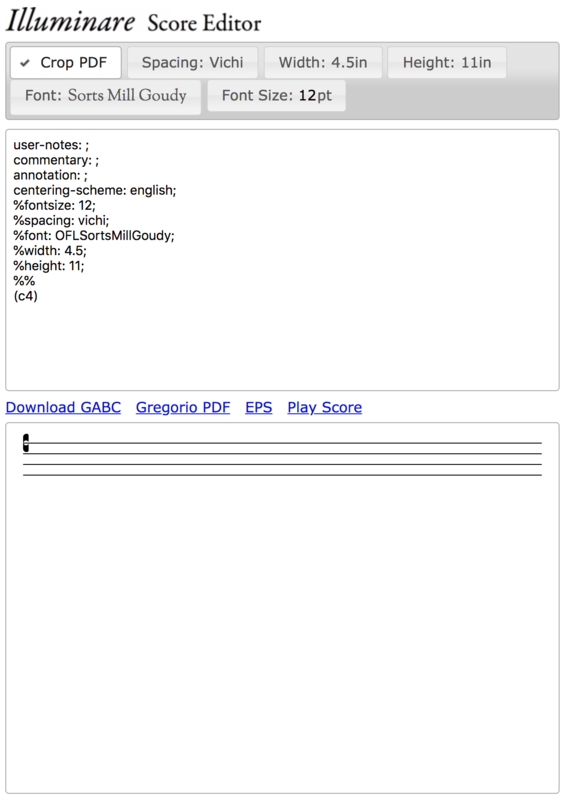 This is what is called “header capture” and is a feature of GregorioTeX that allows you to make use (in a variety of ways) of the information recorded in any of the header fields of your score without having to retype (or even copy/paste) it into the main document. It is controlled entirely on the TeX side of things, however, so Illuminare is handling this in the background for us and we cannot adjust it in this interface. The best we could do here is to comment out the user-notes line (i.e., put a % in front of it) if we wanted to make that line disappear. Having done this we can now see another limitation of Illuminare: it can only handle 1 annotation line. The second line in the gabc is ignored. We can’t force Illuminare to change this behavior, so we’re going to have to live with it (at least until you’re ready to move on to learning TeX). So, having put in the first word, it’s now time to start adding the notes. 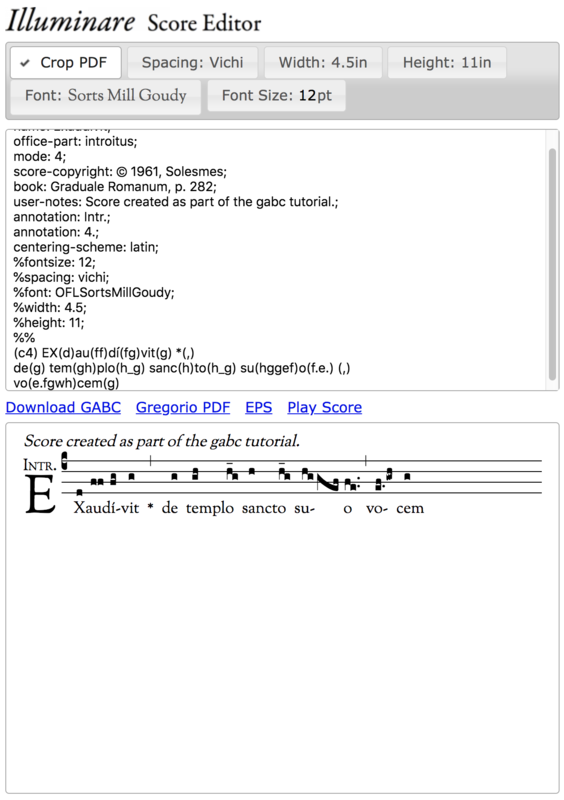 Now, notes are assigned to particular syllables and are marked off from the text of the lyrics by parentheses (()). Furthermore, each note (the pitch of the note) is represented by a particular letter. In this scheme g is in the middle space of the staff and we go backwards in the alphabet (towards a) as we go down and forwards in the alphabet as we go up. Unlike modern notes, there is no point at which the letters start to repeat. That’s because these letters are not note names, they are staff positions. For a similar reason the position or type of the clef does not affect the letters. g will always be the middle position (for a 4-line staff, it’s actually possible to have 2-, 3-, or 5-line staffs which would have a different middle position, but we’re going to ignore those because they are really uncommon). If you paid attention while you were typing, you’ll have noticed that Illuminare automatically matches parentheses when you type the opening one. That's to help you create well formed gabc code that won’t result in errors. Looking at the output, we can also see that hyphens get inserted automatically when they are needed. We don’t have the exact same hyphens as the original score because of minor variations in spacing and that’s something I’m not going to really worry about now. What I am going to worry about, however, is the fact that a couple of my letters appear to be a bit different from the original. Looking closely at the original score we can see that the x is capitalized and that there is an accent on the first i. Before we go any further we should fix these two issues. Fortunately fixing them is easy. In the first case we just replace x with X and in the second we replace i with í. Now, if you keyboard doesn’t have a í on it, you could use whatever method your operating system provides for inputing such characters. Without knowing your OS I can’t tell you what that is, but every modern OS has one. However, Illuminare has provided a shortcut for us. If we place the cursor to the right of the i and enter ' then it will automatically swap out the i' sequence for í. It’s a convenient feature and one that will be used several times as we enter the rest of the score. Well, what do you know. Just entering the notes was enough for Gregorio to do the right thing. Indeed, you’ll find that this is often the case. Gregorio is aware of the conventions that govern the choice of glyphs that go into a neume and follows them automatically. You’ll only need to intervene when you have a score that breaks those conventions (a fairly rare occurrence). The bar that follows we handle just like we did before, just without the asterisk this time. I’m also going to introduce a hard linebreak into my gabc at this point. This line break doesn’t affect the way the score is laid out visually, it just helps me navigate the source should I need to go back and find a particular place later to make a change. Indeed, normally I add a line break after every bar line so I’m also going to go back and put one in after the one we did earlier. You’re free to adopt whatever convention you want for inserting linebreaks. Hey! What do you know, Gregorio has automatically inserted the line break with the correct custos for us. We don’t actually have to describe that portion of the score. This makes it much easier to reuse scores in different contexts where things may change the line breaking decisions (width of page, size of text, etc.). As a result we can just ignore the line breaks in our source and keep going. At this point, we’ve actually been over quite a number of features of gabc. Enough, in fact, that you should be able to input everything up to but not including the last word of the third line (“ejus”) using what we’ve been over. In fact, I challenge you to do just that before continuing with the tutorial. Review what you need to and when you’ve got all of those notes entered, click here to continue with the tutorial.